Now that we are clearly into fall and you have kissed the summer sun goodbye, for now, you may have some regrets regarding how much time you spent outside this summer and how much sun you exposed your skin to. Even though a lot of sunspots will fade on their own over time, there are some sun spots that may just want to stick around for the long haul. Luckily, here at Associated Plastic Surgeons, we have a few non-invasive ways that we can help you get rid of the summer’s sun damage this fall. Let’s take a closer look at how. Getting a regular facial from our office is a great way to moisturize and hydrate your skin so that it’s smoother and healthier. In addition to getting a regular spa facial from our office, however, we also offer facials like the antioxidant sun fader facial that’s designed to help patients like you get rid of age spots caused by sun damage. By using a combination of Vitamins A, C, and E, we can help to rejuvenate and brighten the skin. Another treatment that we may recommend is intense pulsed light or IPL which is designed to target the top few layers of the skin. By heating up the top layers of the skin, IPL works to encourage the growth of newer, healthier skin in its place. After multiple treatments, a lot of patients notice a significant difference in the appearance of their sunspots. 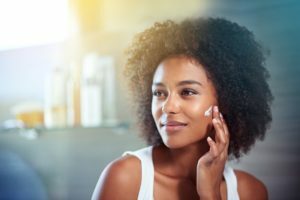 In addition to these types of treatments, we also encourage all of our patients to wear a good sunscreen every day that contains ingredients like zinc oxide in it. This extra layer of protection will help you to keep more sunspots from coming back and will help your skin full heal afterward. Are you interested in learning more about how you can get rid of summer sun damage? Contact our Huntington office today and call us at (631) 423-1000.